My husband was born and raised on the outskirts of London, England, and after many years in the United States, he still has a strong accent. We have many friends from different parts of the United Kingdom, and they have unique accents of their own. Even though some of the cities they come from seem relatively close to each other (by American standards), the accents are very different. 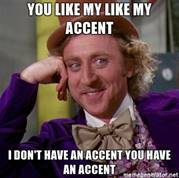 We have our own fair share of accents here in the United States. San Diegans sound different from Bostonians. People in Wisconsin sound different from people in Alabama. 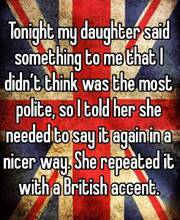 As we cooked dinner the other night, my husband and I were wondering, how do accents develop? It appears that, over time, pronunciation simply deviates when groups are isolated from each other. So though the Pilgrims spoke with an English accent, as time passed, their pronunciation shifted away from their English ancestors. And as they moved about and settled in different parts of the country, their accents diverged even more. So now we are left with a bunch of different accents all over the United States (and all over the world). Everyone has an accent except San Diegans. It’s so weird.